This book swelled my heart with hope and happiness until I thought it would burst. 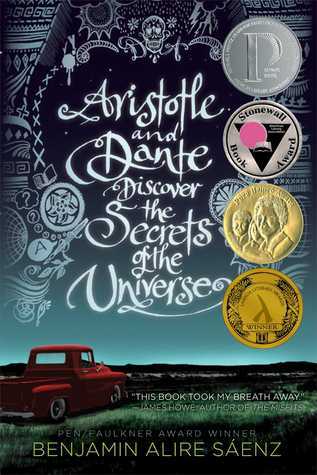 Aristotle & Dante Discover the Secrets of the Universe is definitely deserving of all the praise that has been heaped upon it. It is a novel that gives voice to characters who are outside the ‘white, straight, female’ lead character norm that pervades YA Contemporary. Ari and Dante are both American-born teenagers whose parents are from Mexico. They represent different elements of the Mexican community in America, and both teens struggle with their identity in different ways. On the surface they make an unlikely pair, but they form a strong bond of friendship that enriches both their lives. All the characters in this book are beautifully detailed, and heartbreakingly real. Ari and Dante hold in themselves the hopes and fears of so many teens, their parents are flawed and don’t have all the answers, and Ari’s brother is the not-quite-ghost casting a shadow over Ari’s life. Dante is sensitive and outgoing, Ari is very introverted and struggles to communicate. In one or both of these boys readers will see reflections of themselves. Have you ever wanted to reach into the pages of a book a hold a character’s hand, to give them a hug and tell them things will be ok? There were so many scenes in this book that made me want to leap into the pages, because my heart went out to Ari and Dante, and I cared so much for them. In the end this book was about secrets. Secrets we keep from our friends, our children, our parents and most of all, ourselves. This should be essential reading for all teens 15+ but it is a YA novel of such depth and tenderness that it can be enjoyed by teens and adults alike.